Coins is an encrypted cryptocurrency portfolio management tool created on top of Blockstack. Built from the ground up to measure your performance at varying scales, from fine-grain to high-level insights. As one of the first apps built on Blockstack ever, we're helping to pioneer the new decentralized web. 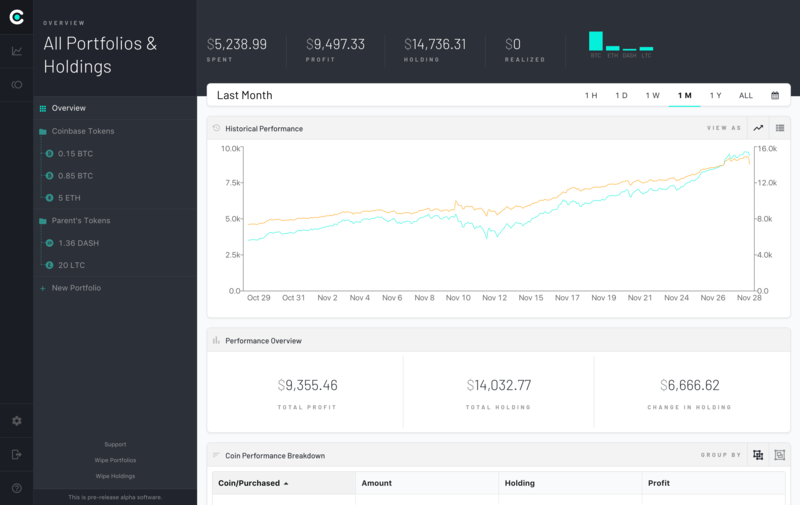 Intuitively track Live and Historical performance data cross-portfolio, by portfolio, by holding, or by token type. We’re built on Blockstack and use Gaia for storage, so your data is encrypted and always yours. We support a large range of both fiat- and crypto-currencies for viewing your dashboard or tracking individual portfolios and holdings. Add labels, exchange data, wallet IDs, and more to generate reports catered to your needs. Often times, investors trade one type of token with another. We want to help you track the performance and opportunity cost. Gain a better understanding of how current events influence your investments. Follow along with our process as we learn how to optimize the decentralized app user experience. Learn about new features before other users. Tune in for exclusive future deals and membership plans. We keep your information private, always.